Sitting atop Rome’s Quirinal Hill, Piazza Barberini is home to two 17th-century fountains designed by Gian Lorenzo Bernini: the ornately sculpted Triton Fountain near the entrance to Palazzo Barberini and the small yet delightful Fountain of Bees. A stop at this bustling square is a must for lovers of baroque art. Piazza Barberini is one of the main transport hubs in central Rome, but look past the bustle of passing traffic and pedestrians to appreciate Bernini’s baroque masterpieces. The square is also home to the National Gallery of Ancient Art (Galleria Nazionale di Arte Antica) in Palazzo Barberini, which contains one of the most important painting collections in Italy, including works by Caravaggio, Titian, and Guercino. Hop-on-hop-off bus tours of Rome’s most famous landmarks stop at the square, as do city highlights tours, which may include sights such as the Trevi Fountain and the Pantheon. 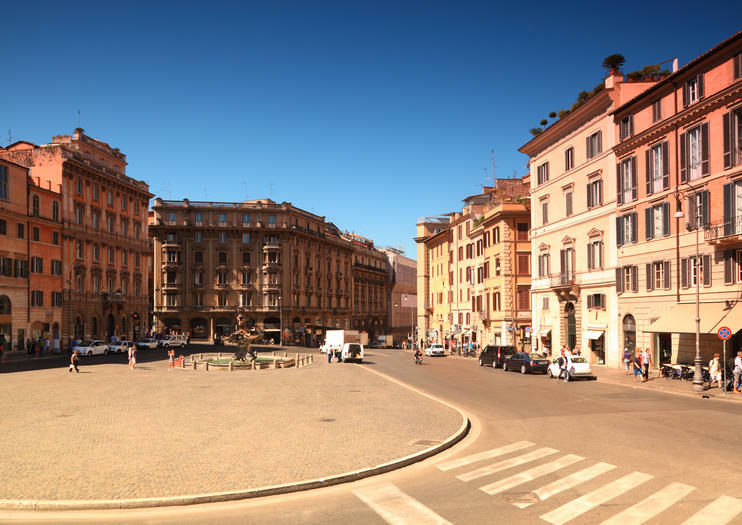 You can opt for a walking or golf-cart tour to explore the square and other top attractions, or see the piazza as part of a food tour with a gelato tasting. The square is especially lovely at night when Bernini’s famous fountains are dramatically lit, so opt for a sunset or twilight tour for unforgettable photos. The square is pedestrian-only in the center, but busy with passing cars and buses around the periphery. If you’re joining a walking or bike tour of Rome and Piazza Barberini, wear comfortable shoes and a sun hat. Piazza Barberini is easy to navigate with a wheelchair or stroller, though the cobblestones make the terrain a bit bumpy. There are plenty of cafés around the square, perfect for a quick snack or drink. Piazza Barberini is located in the historical city center of Rome at the bottom of Via Veneto and is one of the main bus and metro hubs in the city. A number of bus routes and metro line A have stops in the square. Since the piazza can be busy with traffic during the day, the best time to visit is later in the evening when Bernini’s fountains are beautifully lit and the urban chaos somewhat limited. Piazza Barberini is named for Palazzo Barberini, once residence of the powerful Barberini family and now home to the Galleria Nazionale di Arte Antica. Don’t be fooled by the name, however, as the collection focuses on paintings from the 13th to the 18th century and not ancient Roman art. Some of the most beautiful paintings in Rome are gathered here, including Raphael's La Fornarina and a number of works by Filippo Lippi, Titian, and Caravaggio—including his striking Judith Beheading Holofernes (Giuditta e Oloferne).